Whether you are looking for a new house, selling your property, investing, or just browsing the market, you will find all the information you need on our website to make the right decision on your next home project. The real estate market can be overwhelming. Our experience, knowledge, and expertise will help you navigating through the different areas and will lead you to choose the option best suited to your needs. Vancouver has consciously willed itself into becoming a model of contemporary city-making. It is easy to be impress by the city's spectacular setting, the intimate and happy cohabitation of wild nature and built fabric, the tightly packed gleaming new condo towers downtown, the public waterfront, the vibrant neighborhood high streets, the neat parks and lush, the tree line street's homes. Greater Vancouver is hemmed in by mountains to the North and East, by the sea to the West and by the 49th parallel, international boundary to the South. Among Vancouver's most extraordinary urban landscapes are the West side's Kitsilano and Dunbar, and East side's neighborhood's streets lines with impossibly tall rows of perfectly manicured hedges that form vertical green street walls. 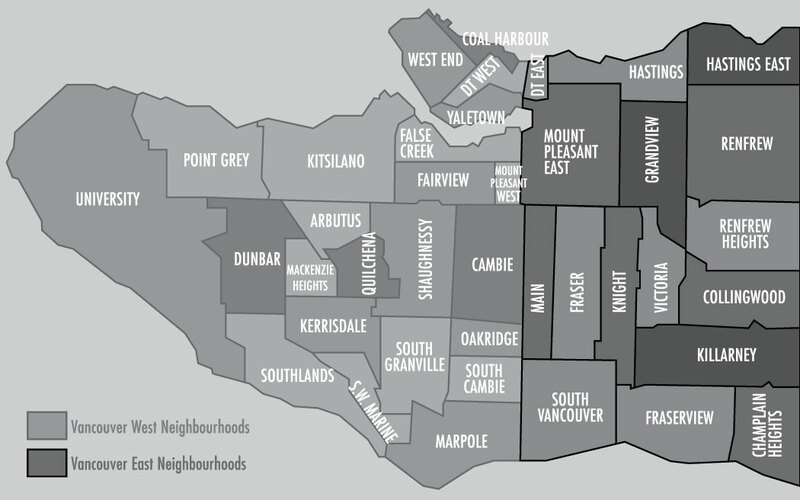 In some residential areas, such as South West Marine Drive in Point Grey, or around the upland of Shaughnessy Heights and Quilchena, the street wall of clipped, soaring dark green cedar, fir, hemlock, are tightly compressed to form an impenetrable barrier, a kind of regimented, domesticated version of the surrounding rain forest. The City of Vancouver has around six hundred thousand residents, approximately thirty percent of the total metropolitan population who live on 50 square miles, which is less than two per cent of the total Greater Vancouver land base of 2,537 square miles. However the total amount of land suitable for urban development is much less, only about 556 square miles because of protected watersheds, local and regional, provincial parks, agricultural land, forest and the land that is too steep to develop.